Blueberry purée and whole blueberries are mixed with Greek yogurt, then frozen into protein-packed Blueberry Coconut Frozen Yogurt Popsicles. A delicious spring and summer treat for both adults and kids. Spring is here! And where some of us may all be still shivering in rainy, snowy weather, you know we’re all thinking about warm spring and summer days. Be prepared! There’s nothing wrong with being armed and ready with healthy treats for the kids after a day of playing outside or swimming in the pool. Your kids think just they’re eating a creamy, sweet popsicle but only you know that they’re getting protein, calcium, fiber, vitamin C and more from just 1 popsicle. 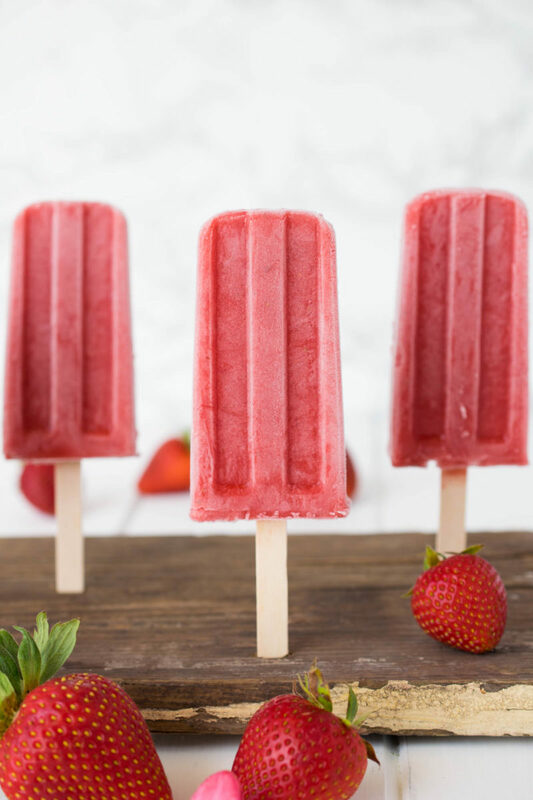 With just 2 healthy ingredients, these popsicles are so easy to prepare (which is a big help for parents) and that’s a win-win all around. This snack hack is brought to you with the help of Dole frozen blueberries. Available in 12, 32, 48 ounce resealable bags, as well as a 40-ounce bag of pre-portioned blueberries. They are all so convenient to keep in your freezer all year round. The all-natural blueberries are just as nutritious as fresh fruit because they are frozen at their peak and are NON-GMO. Throw them in your pancakes, make a smoothie, the uses are endless. These popsicles could not be easier to make. Firstly, find your favorite popsicle mold (that’s easy). Just browse your favorite shopping website and you’ll have it in 2 days. The frozen blueberries are transformed into a stunning purple puree that is swirled into the yogurt. Whole blueberries are distributed around the popsicles that create texture and a pretty presentation. The recipe measurements are for the popsicle mold I have. Different ones may vary, so you will need to adjust accordingly, but the beauty is, you can’t mess them up! Get the kids involved in the making of the popsicle and they will be their new spring and summer obsession, and probably yours too. 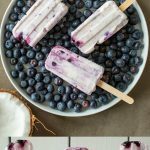 If you’ve tried these Blueberry Coconut Frozen Yogurt Popsicles or any other recipe on the blog, then don’t forget to rate the recipe and let me know it turned out in the comments below. I love to hear from my readers! Blueberry purée and whole blueberries are mixed with Greek yogurt, then frozen into protein-packed Blueberry Coconut Frozen Yogurt Popsicles. To a blender, add the ½ cup blueberries and 1 teaspoon water, blend until smooth. Set aside. To a bowl, add the yogurt and the pureed blueberries. Use 2 toothpicks to swirl. Add 2 whole blueberries to the bottom of the popsicle molds, fill 1/3 with yogurt mix, add 2 more blueberries and top with more yogurt mix. Fill 8 molds, add sticks and freeze 8 hours, or overnight. To remove the popsicles, run under warm water to loosen. Avoid running the water near the sticks. Remove and enjoy.